Did Chronic Pain Patients Help Elect President Trump? Rates of opioid prescribing were significantly higher in counties that voted for Donald Trump in the 2016 presidential election, according to a new analysis published in JAMA Network Open. Researchers at the University of Texas compared voting trends, census information and Medicare data for people who received opioid prescriptions for 90 days or more. Nearly 60 percent of U.S. counties that voted for Trump had an above average opioid prescribing rate in 2015. Counties with below average prescribing rates voted for Trump only 39 percent of the time. The researchers cautioned that the study does not mean that chronic pain patients were more likely to vote for Trump. It’s more likely to indicate that economic, health and social problems that lead to opioid use – sometimes called the "epidemic of despair" -- played a role in Trump’s victory. 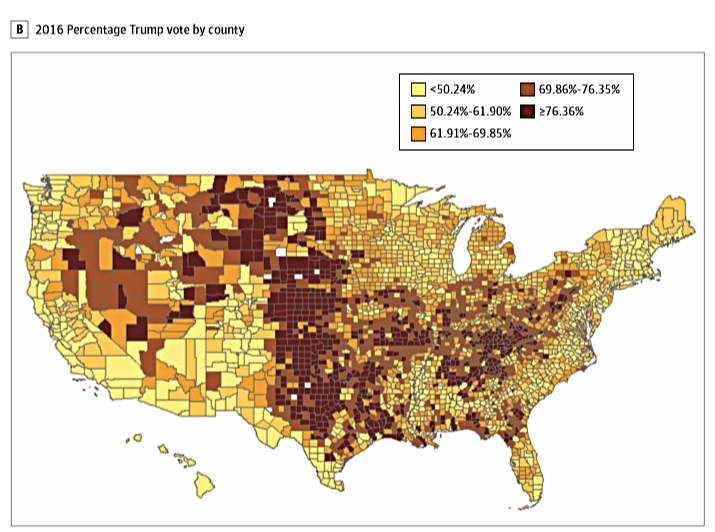 The researchers created a map (above) showing counties with the highest rates of opioid prescribing in dark red, while a second map (below) shows counties that overwhelmingly voted for Trump in dark red. The maps have similarities, but they don’t align perfectly or prove a cause and effect relationship between prescribing and voting. For example, while Trump won unexpected victories in Michigan, Wisconsin and Pennsylvania, where opioid prescribing is high, he also won in North and South Dakota, where prescribing rates are relatively low. During the 2016 presidential campaign, Trump and Hillary Clinton both called for further restrictions on opioid prescriptions and expanded access to addiction treatment. Clinton also endorsed a proposed tax on opioid pain medication. “Given that both candidates focused on opiate addiction as a major campaign issue, it is difficult to infer that opiate prescription rates are somehow linked with voting behavior based on the candidates’ respective campaign promises and/or platforms,” wrote James Rosenquist, MD, in an editorial also published in JAMA Open Network. The “epidemic of despair” was first documented by Princeton researchers Anne Case and Angus Deaton in 2015. They believe that the reduced life expectancy of middle-aged white Americans is linked to substance abuse, unemployment, poor finances, lack of education, divorce, depression and loss of social connections. "People who reach for an opioid might also reach for ... near-term fixes," Nancy Morden, PhD, a professor at the Dartmouth Institute for Health Policy and Clinical Practice, told NPR. "I think that Donald Trump's campaign was a promise for near-term relief."